In high contrast to this fixer upper 1970's home, these homeowners were surrounded by gorgeous wetland views. Our exterior design focus was to make the homes wetland views visible from as many rooms as possible, and to add a warm modern touch with a shed roof, stone pillars and, steel columns. The features of this home include an addition that accommodates a new master bathroom and walk-in closet, a cutting edge kitchen design, large patio doors and windows that allow additional light into the home in the winter., energy improvements and new mechanical systems. The timeless design is functional as well as beautiful. The choice of materials and the overall design reduces ongoing maintenance allowing the homeowners to stay in this house well into their retirement years. Four stone pillars now mark their way across the original house, with more stone on the sunroom and garage addition. The foyer roof also makes a statement. 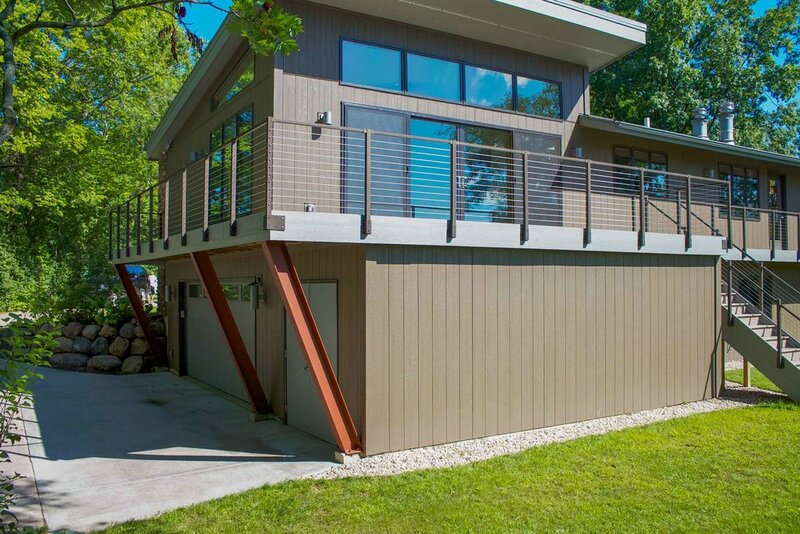 The steel i-beam supporting the roof is a functional design element that's repeated on the garage end of the sunroom. As with most raised ranch houses, the foyer was minimal. By extending the wing walls vertically to the ground and covering them with stone, we were able to build an entryway closet. Four stone pillars now mark their way across the original house, with more stone on the sunroom and garage addition. The foyer roof also makes a statement. Mimicking the roof of the new sunroom, this shed style roof is also a contemporary design feature. The steel i-beam supporting the roof is and element repeated on the garage end of the sunroom. Below the deck is a garage and storage room. The storage room is an unconditioned space made for storage lawn mower and snowblower. The fully insulated garage is located under the living space. The steel I-beam columns supporting the deck repeat the steel I-beam details used on the front door of the house, emphasizing another important element of design...repetition. One of the main goals in this remodel was to give our clients a better front entry. Not only were we able to give them a front hall closet (not visible), but we upgraded the entire look of the house in both the interior and exterior by installing a new contemporary stainless steel door. We also installed a beautiful hanging light that enhances the modern character of the space. 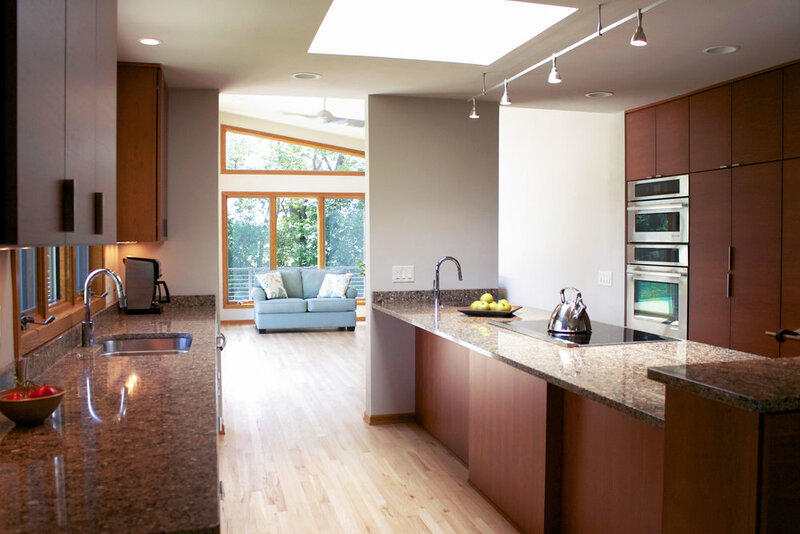 A large sunroom and modern kitchen remodel were part of this extensive home remodeling project. Click here to view images and the project page of the kitchen renovation. Click here to view the project page for the sunroom.